The Ukrainian Institute of Modern Art is pleased to present “Ruminate,” a three-person exhibition of work by Robin Dluzen, Cydney Lewis and Allison Svoboda. For these three Chicago-based artists, contemplative thought processes address the confluence of and contrasts between humans and nature, using a vast range of meaningful, tactile materials. For Robin Dluzen, the intersection of labor and landscape is at the core of her practice, and here, a new series of charcoal drawings on stretched lawn-refuse bags consider the artist’s mother’s 30-year career as a horticulturalist. 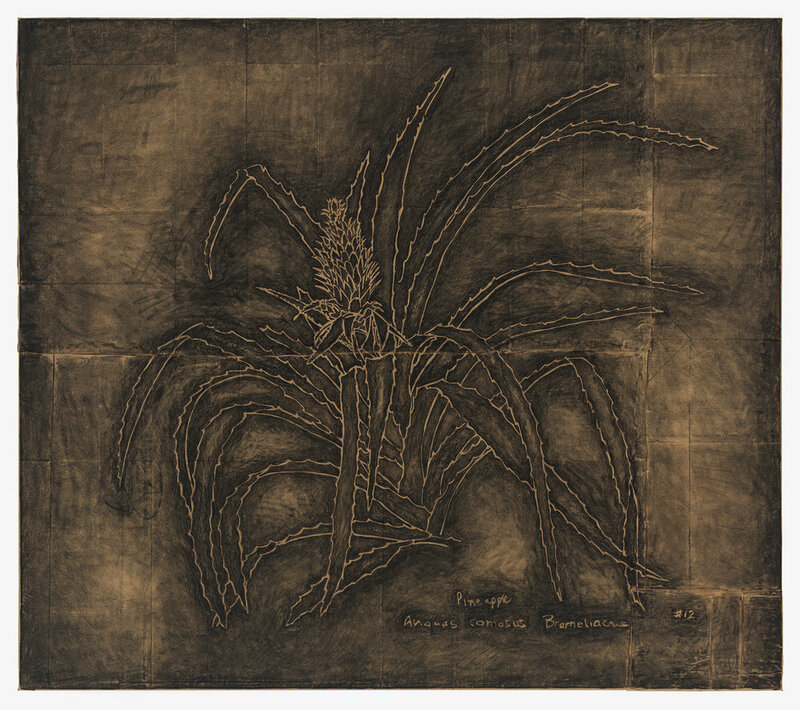 In this exhibition, Dluzen redraws the precisely rendered botanical drawings created by her recently retired mother over the course of her tenure; Dluzen preserves the gestures of her mother’s hand (and even her signature), combining them with her own in works that truly have two authors, collaborating decades apart. Cydney Lewis, too, looks to everyday materials, both embracing the lowness and the unaesthetic nature of man made matter like plastic paper towel wrapping and dry cleaning bags, and also completely transcending their humble origins. In her installation pieces, the twisted, wired plastics become extraordinarily laborious, vivid recreations of flora. Accompanying these sculptural pieces are a series of ink drawings, taking cues from the aesthetics of black and white films to address a number of symbolic dualistic tensions, including that of race. Created during a recent fellowship studying Zen and traditional artistic techniques in Japan, Allison Svoboda exhibits a number of multimedia works that use fractals found in nature as catalysts. In her collage works, thousands of brushstrokes on paper are torn and reassembled into a monochromatic, wall-bound mandala. In Svoboda’s Scorched Vestments, a burning incense stick is the sole mark-making tool. Cotton sheets hand dyed with indigo shibori are suspended from the ceiling, suggesting a kind of soft, temple-like architecture. Light refraction from the Vernal Equinox is featured in a video piece. Together, these varied materials and processes create a rich, meditative experience. A catalog is published in conjunction with the exhibition, featuring an essay by artist and art critic, Alan Pocaro. Charcoal on lawn refuse bags and stretcher, 56 x 64 in.